All the experts agree: the 21st century belongs to China. Given America's looming insolvency and the possibility of the collapse of the U.S. dollar, who can doubt that China is poised to take over the role of economic superpower? Written by political economist and leading financial journalist James Gorrie, this book offers a highly controversial, contrarian view of contemporary China. Drawing upon a wealth of historical and up-to-the-minute data, Gorrie makes a strong case that China, itself, is on the verge of an economic crisis of epic proportions. 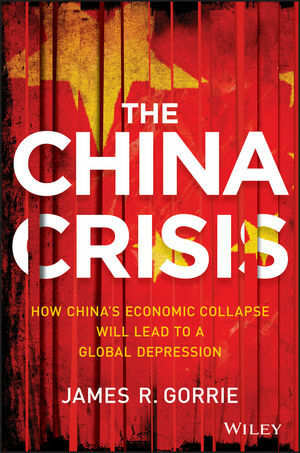 He explains how, caught in a recurrent boom/bust cycle that has played itself out several times over the past sixty years, China is again approaching total economic and social collapse. But with one important difference this time: they may very well take the entire global economy down with them. JAMES R. GORRIE writes on macroeconomic topics, investment strategies, and geopolitical events around the world. He has interviewed experts such as renowned economist James K. Galbraith, currency expert Craig R. Smith, and real estate master George Ross of the Trump Organization. His articles have appeared or been referenced on sites such as MSN Money, Seeking Alpha, and Yahoo! Business News. He has served as Editorial Director and Managing Editor for digital publishing firms and is also an award-winning screenwriter, filmmaker (The Indian), and novelist. James also ghostwrites for both famous and semi-famous personalities in America and abroad. Before writing professionally, James spent over eighteen years in the financial industry. He attended the University of California at Santa Barbara where he reached doctoral candidacy in international relations and comparative politics, with an area specialty in international political economy; he also holds a bachelor's degree in economics. James lives in Austin, Texas, with his family and is busy writing for clients, his next novel, a couple of screenplays and another book.